This forklift manages massive loads with its high capacity lifting capabilities. It’s the largest of the CGC lift truck family and works best in tough indoor applications, such as processing mills, machinery moving, warehousing and manufacturing. 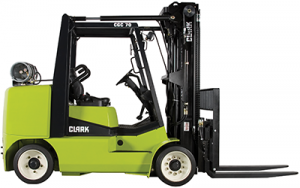 This forklift is best suited for indoor use, but it’s durable and powerful. Its ergonomic design creates a smooth ride for the operator. The transmission automatically disengages to prevent the truck from moving on its own. The 6 rollers manage load distribution and reduces free play. Incorporates the most engine power, makes sure the attachments can perform efficiently, designed into sections and has an upright mounted load lowering valve. One-piece for durability and cast steel for strength and longevity. Tilt cylinder is attached to the frame for extra security and strength. Auto Shutdown protects the lift truck in the event of excessive engine coolant, high transmission oil temperature or low engine oil pressure. Integral axle and transmission are not exposed, so outside contaminants won’t disturb the axle and transmission. Controlled shift protects the gear shift. A common sump is used to efficiently cool the axle and transmission in a simple mechanism. An inching valve gives the operator steady control while lifting the forks. The seat deck rises to service the engine, transmission and hydraulics. “Double Shear” design with a simple, double-ended cylinder.